Riddle Corpses EX doesn't go beyond its initial premise and I'll admit I'm more than tired of zombies and demons as the go-to cookie-cutter enemies. With a bit more personality or perhaps some original ideas, it'd be a no-brainer to recommend. As is, it's simply a fun and challenging twin-stick shooter that's perfect in short bursts. Quite frankly, that's good enough. Riddled Corpses' solid gameplay and faithful "retro feel" mostly make up for a limited and sometimes disappointing progression system. It's likely to please those who don't mind grinding as well as those who enjoy a challenge – superficial and linear as it may be. Riddled Corpses EX has a strong foundation with a steep but engaging difficulty. The game is grindy, though, and has a few things keeping it from feeling polished and complete. Either way, Riddled Corpses EX has everything an addictive twin-stick shooter should have, and it does those things well. Riddled Corpses EX has enough indie charm to land without a thud in the niche twin-stick shooter space. An enjoyable foundation allows tense gameplay to occasionally shine but a repetitive loop that leans towards heavy grinding slows down what could have been 16-bit gem. 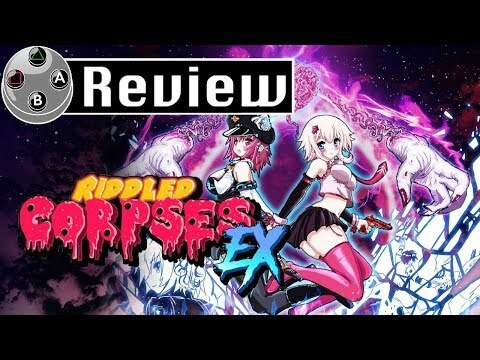 Riddled Corpses EX is a fun twin-stick roguelike release that is very challenging, but its gameplay mechanics are very easy to understand, making this one a game that is easy to pick up and get the hang of. The grind for this one is very real, especially if you want to get all trophies for the game, since this one has a full trophy list with a Platinum for you! This one is probably best suited for short bursts of gaming, which is why its great that you can play it on PlayStation Vita. Riddled Corpses EX is a fun arcade-style twin-stick release that is a great pick-up-and-play release. I do feel it benefits from being on PlayStation Vita since it's perfect for playing short 10-15 minute sessions here and there, instead of having to sit down for longer gaming sessions. Cowcat did a lot of work to give us an enhanced version of Riddled Corpses on Sony's portable, hence the EX in the title, making this the definitive version and a game you should definitely try. While Riddled Corpses EX's gameplay and upgrades are enjoyable, its lack of content and excessive amount of forced grinding simply to pad the game's longevity result in it being a mostly bland and repetitive affair. Riddled Corpses EX is the perfect example of how a remastered game should look in this generation of gaming. Fabrice Breton (COWCAT) has taken everything good about the original PC version of Riddled Corpses and improved, tweaked, fixed, and added things in order to deliver a solid twin-stick Rogue-like shooter with very addictive gameplay. Sure, there is a bit of grinding and some people may think it’s a bit monotonous or repetitive, but I had a blast playing for seven hours straight as I popped on a few podcasts and albums and pushed my way through wave after wave of disgusting pixel beings! The Cross Buy (with an extra platinum) is an extra bonus for us Sony gamers and for all the trophy hunters out there, just be aware that you’ll probably need about 10-15 hours in order to work your way through each iteration of the game. Riddled Corpses EX is an excellent twin stick shooter that does something different with the formula and piles on the enemies. [I]t’s obvious that a lot of effort was put into addressing criticisms while keeping the core of the game intact for those who enjoy a little grinding. The end result is a charmingly chaotic pixel shooter with different modes designed to accommodate different types of players.